By working in collaboration with Arm, the Canadian cloud computing provider, VEXXHOST, announced plans to offer commercially available Arm®-based virtual machines with OpenStack® API access allowing users to leverage both technologies on public, private and hybrid cloud. Montreal – September 12, 2018 - VEXXHOST, in collaboration with Arm, announced plans to offer commercially available Arm®-based virtual machines with OpenStack® API access. This architecture, which is exclusively offered at VEXXHOST, allows the Canadian cloud provider to give users access to virtualized 64-bit Arm hardware using existing OpenStack based public, private, and hybrid clouds. 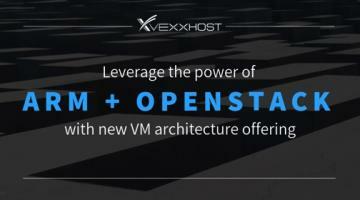 The VEXXHOST solution eliminates the complexity of setting up Arm infrastructure for use with OpenStack. Developers building for Arm now have access to highly performant, readily available virtual machines. Additionally, it will be quicker and easier for open source projects to build and test for multi-architecture support. The Canadian cloud provider believes this integration is an essential step in building a multi architectural ecosystem and showcases the diversity of the architectures that OpenStack supports. As an existing OpenStack infrastructure donor, VEXXHOST is pleased to provide Arm-based infrastructure to the OpenStack community further strengthening support for the Arm architecture. “We could see the benefit of offering a multi-architecture platform which made the decision to integrate 64-bit chips into our infrastructure an easy one. We are grateful to have worked with Arm to make this possible and to offer this alternative to clients with use cases that will benefit from it,” said Mohammed Naser, CEO of VEXXHOST. VEXXHOST users benefit from the reduced costs associated with the new Arm-based virtual machines. The Arm architecture consumes less power, requires less cooling and is well supported by a wide variety of open source software that reduces licensing fees, VEXXHOST passes on the savings to its clients and offers competitive pricing. Additionally, integrating servers running 64-bit Arm-based chips into their OpenStack public cloud platform results in a flexible and on-demand solution for users. Public cloud users are now able to provision hourly, on-demand instances which eliminate the capital expenditures attached to acquiring hardware. Users simply pay for the hours of usage they have accumulated. Starting today, users can choose between launching instances using the existing Intel x86 architecture or the new Arm-powered virtual machines, both running the latest OpenStack Queens release and very soon to be Rocky. To celebrate, users can now sign up and take advantage of a limited time 15% discount offered for virtual machines based on Arm technology. For more information or to sign up, visit https://vexxhost.com/public-cloud/servers. Founded in 2006, VEXXHOST Inc. is a Canadian cloud computing provider offering OpenStack public cloud, private cloud, hybrid cloud and consulting solutions to customers, from small businesses to governments, from over 150 different countries. VEXXHOST Inc. delivers a high level of expertise to help clients optimize cloud infrastructure so they can focus on their core competencies. For more information, visit https://vexxhost.com or follow VEXXHOST on Twitter @vexxhost.